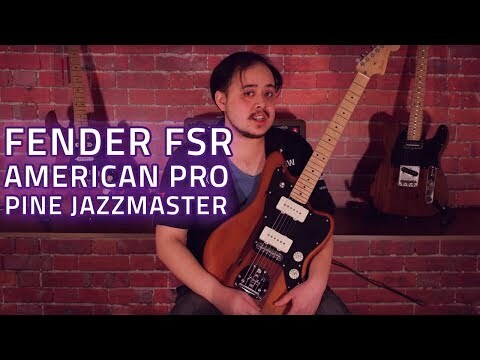 This FSR Limited Edition Jazzmaster is 'Born In The USA' - in every sense of the word! This northern-grown Hardwood features expertly m.. This FSR Limited Edition Jazzmaster is 'Born In The USA' - in every sense of the word! This northern-grown Hardwood features expertly matched veneers, courtesy of the exert lumberjacks at Buckstaff Furniture Company, MI USA. The result is a truly unique and gorgeous Pine body Jazzmaster, kitted out with a pair of V-Mod single-coil Jazzmaster pickups and USA Pro specs. For your chance at a one-off collector's item, these FSR runs are a spectacular addition to the Fender Custom Shop lineup. The grain, knotholes and man-made imperfections make each one unique. We anticipate high interest and very limited stock - so Pre-Order at your local PMT Store or call us on 0151 448 2089 today. The Limited Edition American Professional Pine Jazzmaster is loaded with a pair of V-Mod single-coil Jazzmaster pickups, kicking out vintage-inspired tone while the new treble-bleed tone circuit retains high end clarity, no matter where the volume control is set. Topped by 22 narrow-tall frets for easy bending, the 9.5"-radius maple fingerboard is ideal for most playing styles, offering enough arc for comfortable chording while remaining flat enough for wide bends. The improved tremolo and bridge incorporate a screw-in arm and brass Mustang saddles that stabilize the strings while enhancing your tone. Bridge: "Jazzmaster/Jaguar Bridge with Nickel-Plated Brass Mustang® Saddles set to 9.5 inch Radius and Vintage-Style Floating Tremolo with Tremolo Lock Button and Screw-In Tremolo Arm"